The ECOS Project (which stands for Every Community Offering Service) is a 501(c)(3) not-for-proﬁt organization that facilitates community service through a unique synergistic system. This three part system integrates community need, community support, and community service for the betterment of all. As we near the end of 2018, with record breaking metrics in community service activity and impact in sight, we excitingly look toward 2019 committed to continuing our mission to positively impact our communities by way of our youth. While our keiki community is at the heart of our methodology, from the onset, our goal was to provide opportunity for EVERYONE to have a fingerprint on the betterment of our community and the lives therein. Now that we near the end of our fourth year of service, and have proven our ECOS system works and greatly impacts many exponentially, we are ready to launch the next step in our organization’s evolution. The Plan and the Seed… The original objective was to engage more people, of all ages, in the advancement of our local and global communities. However to ensure the impact was not just a fleeting one-off act of kindness, we focus on youth development, increasing their awareness and planting the seeds of compassion and actions for others. The triple bottom line with our ECOS system is 1) we support the various needs of our community, 2) our youth participants learn valuable trade skills, environmental sciences, practices of sustainability, cultural foundations, an ethic to work, etc, and 3) our youth participants earn funds necessary to sustain their group/team/organization’s needs or activities. The concept of “earn while they learn" is a much better option than seeing our youth asking for or expect handouts. To continue offering a minimum of two to four community service projects per month in 2019, we are launching our ECOS 50/500 funding campaign. Our goal is to find 50 individuals or corporations who will donate $500 or more to support our base number of community service activities for the year. Should our funding goal be reached, it will allow us to once again achieve new benchmarks and take us over 2000 community service hours and well over 600 youth participants. With 70 - 80% of all funds going directly to our youth participants, your generous donations really do help our keiki do amazing things both for the community and themselves. Year 2019 : 50/500 = 2000+ service hours by more than 600 youth participants. Year 2021 : 500/100 = 5000+ service hours by more than 2000 youth participants. Year 2022 : 10,000/20 = 10,000+ service hours by more than 5000 youth participants. To donate click the DONATE button at the bottom of this page. 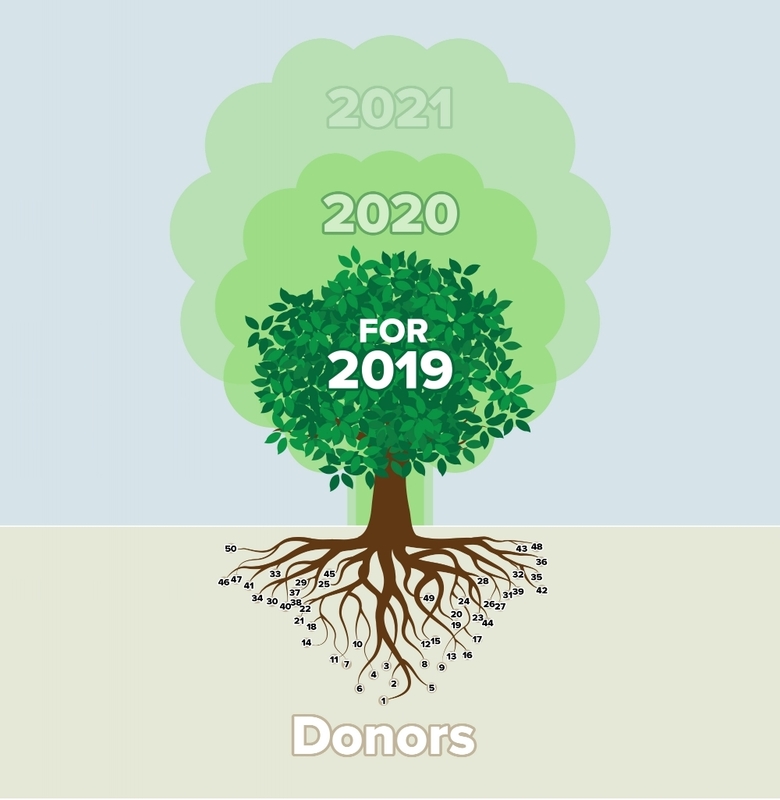 All donations will be tabulated and all qualifying donations will be notated on the ECOS Funding Tree on our Supporters page. The affect we have on the environment, the lives of those in need, the beautification within our communities, are outdone by the affect our projects have on the individuals doing work helping others. And THIS is at the heart of our mission. 2018 is becoming a stellar year for ECOS, and will eclipse our first three years combined! This year we were blessed to receive much needed financial support from the Hawaiian Airlines Foundation and Hawaii Community Foundation, that allow us to maximize our efforts in communities across Oahu. By year end, we will more than double previous year’s community service activity, community service participants, community service beneficiaries, and monies earned by youth organizations. As we forge this path forward into new and exciting opportunities, we remember to stay firmly connected to our mission, anchored in creating meaningful interactions with our keiki that guides them to becoming upstanding stewards of our world. For many of our youth participants, our ECOS community service projects are the first time doing such activities. And thankfully there are also a growing number of repeat participants, showing positive outcomes that last. We invite you to #ComePassionate and team up with us! Here’s how: - Let us know how we can help your community. - Let us know if your youth group (10-18 years of age) would like to do an ECOS community service project. - Make a tax deductible donation that enables us to make these opportunities possible. We are extremely happy and proud that the following metrics show ECOS' steady growth through the first three years since ECOS' inception. And Year 4 is on pace to eclipse the first three years combined! Come join our team, and "be the change you want to see in the world." To see the fantastic work our keiki have been doing and other current events, please click on the Facebook and Instagram icons below. And don't forget to LIKE and FOLLOW!